Sven van Caekenberghe has written a very nice tutorial implementing a Reddit clone in Pharo using Seaside, Glorp and PostgreSQL. Sven also makes available a prebuilt image containing the application. Seeing that the image contains Glorp working with the PostgresV2 driver, I set about integrating NBSQLite3 with Glorp. 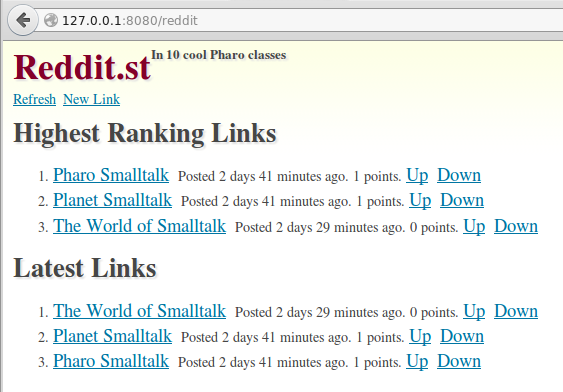 After about an afternoon's work, I now have Reddit.st working with Glorp+NBSQLite3. There is still much to be done to get Glorp fully working with NBSQLite3: Some tests apparently expect Glorp proxies, but are getting OrderedCollections, and one particular test rendered my Linux X session non-responsive to mouse and keyboard, except for screen brightness key chords!